It was a long weekend the weekend before last and we got loads done. Loads! But the fall out from that left me feeling overwhelmed. When hubby suggested we get that trip to the tip done I jumped at the chance and off we went to the special waste transfer station. We piled up the ute with all the crazy things that we can't put into the rubbish or take to our local transfer station. We weren't able to fit everything in that I would have liked to take but most of that hard to discard stuff like car batteries, got loaded up. We paid the exorbitant fees and those crazy hard to ditch items are now gone, recycled as appropriate for each item. It felt so good to get all that stuff out of our driveway and shed. That wonderful feeling made me feel like we'd made the best decluttering progress ever. I was euphoric with the joy of less stuff! It felt so good that when hubby and I were discussing how he needed a dedicated space of his own other then the shed, I suggested that we could transform the storage area into a work space for him. 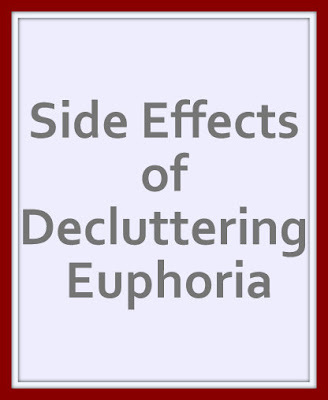 When I made that suggestion it is possible I wasn't thinking very clearly, that I may have been a little under the influence of decluttering euphoria. There is a chance I should not have been making such life clutter changing decisions at that time. Moving hubby into that room meant that 90% of what was in that room had to be moved out of there to "somewhere else". Although I'd made more progress in the storage room since I last showed it to you, every inch of space that I had cleared had been filled straight back up again from around the house. That room was pretty much our only storage area and I didn't think about where everything would go if it stopped being a storage area. "Somewhere else" turned out to be the dining room where all the stuff was waiting for me to tackle it and solve the problem of what to do with it. When I made the suggestion that hubby move into that room I think I imagined this would mean he would move his desk out of the lounge room, but I didn't really think that through. Although all of his hobby stuff was moved into that room - which is awesome - his work stuff stayed with the desk in the lounge, the room with all the connections and power needed for computers and what not. I spent a lot of last week tackling the huge pile of stuff in the dining room, I was so determined to get through it that I didn't get an end of week post up. Because I'd reduced the clutter in the house during previous decluttering sessions quite a few things were able to be put where they should be kept. Shoes for instance were able to go where shoes actually go, in my wardrobe. There are limitations to what can go in the rubbish or how many donations can go in the hallway until they get carted off to goodwill but I made the most of every bit of space I could. And although it felt insurmountable and overwhelming I kept at it. I aggregated half empty boxes into full boxes. I placed like with like and I refused to waste time angsting over stuff that I was indecisive about. I tackled the stuff I was sure of, like the coat hangers that had been breeding worse then rabbits, goodwill got a huge pile of them and I got to keep my favourites. I found that I was a whole lot more ready to let go of the stuff in storage then I'd thought. Although I am ready to let it go a lot of it is stuff I will sell rather then donate so it will have to be stored somewhere for now. At least it is all aggregated together and not all over the place higlty piglty, some in this box, some in that. Quite a few UFO's got moved into the sewing room too, unless I decided I won't be bothering with them. There will be more on those in the future. It feels good to have all the things that were in 'storage' actually 'organised' for want of a better word. Now I can look at that huge pile of boxes and I can tell what is left to sort through, it's less then half. It feels so much more doable then it did when it was all squirrelled away in that room so I'm really pleased it's all out of there now. At the beginning of last week it all seemed too much with the domino effect of emptying a room in full swing. But at the start of this week I feel in control. 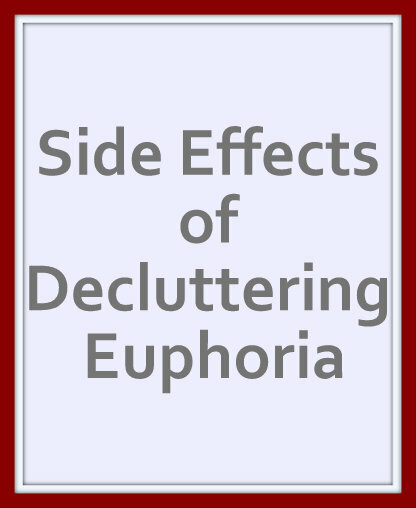 I feel like I know what needs to be done next and that there is a light at the end of the decluttering tunnel. We still need some storage space, we aren't ready to become minimalists just yet, but that is a problem for another day. Oh yeah, and did I mention that on that same weekend I knocked out a tiled wall, added insulation and got new plasterboard up? It made a bit of a mess. Yeah, it was a busy weekend. It definitely feels a lot better after decluttering!! Wow you really were busy! And that's only the stuff I blogged about. You were on fire! Congrats on getting so much done!! You are killing it, Stella. I still need to push through and get that finished, I'm almost there. Why did it let me comment as PS up there, but won't now? Sorry, I know I'm obsessing over this, but it's driving me crazy! And it even automatically switched me from PS to Melinda Mitchell! How dare it!! I get to say who I want to be today! !